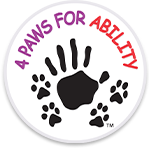 Interested in learning more about 4 Paws for Ability? Sign up to tour our facility! My best friend is interested in learning more about 4 Paws after seeing my passion for the organization! I work with 4 Paws for Ability at EKCC in Ky and would like to see what the puppies do after they leave our institution.